Upfor presented works by Rodrigo Valenzuela, Zach Gage (central pillar) and Ralph Pugay (right wall). Rodrigo Valenzuela giving a talk during a tour of the Fair. Photo courtesy Artsource Consulting. Artist Rodrigo Valenzuela talking about his newest work, Sense of Place No. 1, with Fair-goers. 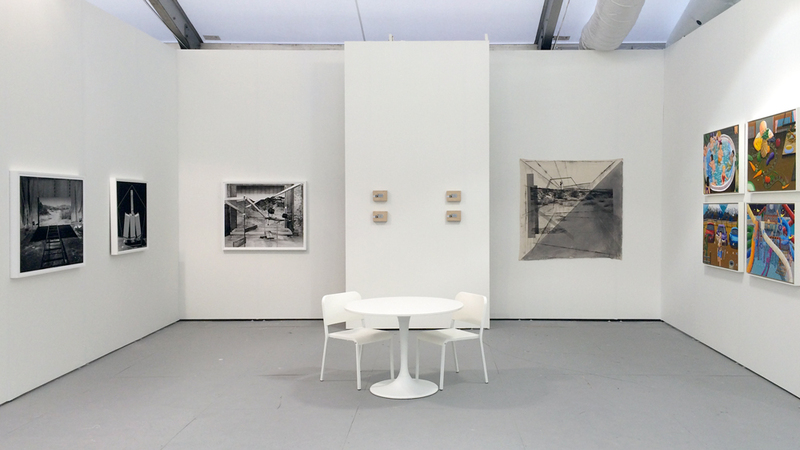 For the second year, Upfor participated in UNTITLED., a curated art fair for international galleries and nonprofit art spaces with a focus on emerging and mid-career contemporary art. Upfor presented a selection of new and recent photographs by Rodrigo Valenzuela, paintings by Ralph Pugay and media works from Zach Gage's Glaciers series.